Yesterday’s victory over Edmonton wasn’t exactly the most riveting but it was certainly necessary. The Sabres got decent goaltending from Ryan Miller, scored four goals and gutted out their first win of 2012. Miller was credited with 23 saves on the night, a few of them were solid saves that needed to be made. However, he gave up three goals yet again. Certainly Taylor Hall’s first tally should have been stopped. He could certainly get a pass on the other two.Nikolai Khabibulin gave up a real softie after the first Edmonton goal, so Miller is all but absolved in that situation. The Sabres have another shot at their first win streak since November on Friday night in Raleigh. Considering how the season has gone, that may have been the closest to a complete effort the Sabres have put forth in quite some time. Maybe even all season. Buffalo managed to overcome an early deficit – and horrible play – to tie the game. They faced down another challenge after relinquishing their lead and managed to build a cushion late in the third. While it was no better than a 40-minute effort, the Sabres pieced together a respectable win. The key will now be to build on it. Jhonas Enroth would be a good choice to start on Friday. He has all but owned the Hurricanes in his short time in the NHL and Miller would likely fare better against the Jets. Yes, the same team that pumped him for five goals earlier in the season. Zack Kassian will likely be packing his bags for Rochester in the coming days. With Ville Leino inching closer to a return and Tyler Ennis also coming close, Kassian will certainly be shipped back to the AHL. It is obvious Kassian needs a little more prodding to play his game on a consistent basis. It would be ideal to get a veteran next to him in the room to provide the guidance that will be necessary for him to truly blossom. Look at the effect Mike Grier had on Thomas Vanek. Now equate the same results to Kassian. The Sabres are still in need of help on the blueline. Obviously injuries to three of their top five rear guards hurts matters. Still, with all of the offensive talent on defense in Buffalo and Rochester, it wouldn’t kill the Sabres to bring in a little more grit in the form of a stay-at-home type defender. Bucky Gleason pointed to the potential for some trades in the near future. From the out of left field department: would Tyler Ennis fetch a quality return on the trade market? He is a dynamic winger with a lethal scoring touch. If a team out West was interested, would it be worth including him in a package? Remember, you need to send skill to receive skill. Anyone still harping about Christian Ehrhoff being a waste can probably stop now. Despite lacking flashy goal stats, Ehrhoff clearly had a strong influence on the power play. Without Myers and Ehrhoff, that unit looks quite lost. Yet again Jordan Leopold proves how valuable he is to this team. He may be one of the best signings Darcy Regier has made in a long time. To think, he was brought in when the team was still budget conscious. 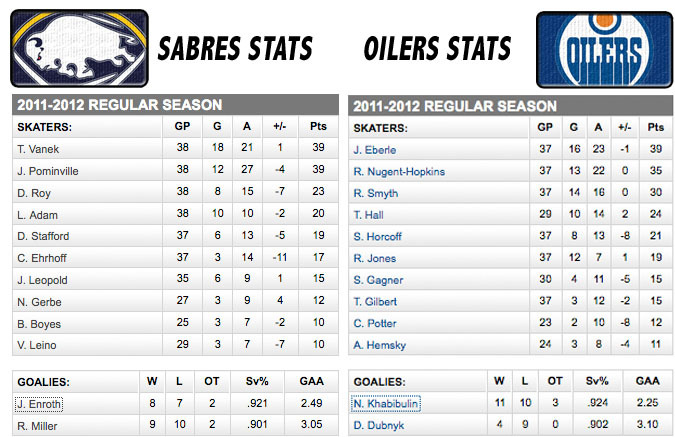 Thinking back to January and February of 2011 would likely bring joy to most Sabres fans. January involved the coming of the World Junior Championship, the thick of the Pegula-mania rumors/reports and the beginning of Buffalo’s turnaround. February was even better. The Sabres were in the thick of a magnificent run that carried them to the playoffs, Pegula’s ownership was formally announced and it seemed as if the sky was the limit. The month culminated with a trade deadline acquisition that would have been foreign in years past. Brad Boyes was the cherry on top of two glorious months, his contributions fueled Buffalo’s surge, despite the fact that he tailed off since the end of last season. Now the Sabres are faced with a similar predicament. Buffalo currently sits five points out of fifth in the East (with one game in hand) and have suffered a terrible run of poor hockey and injuries. Their first chance to crawl from their grave comes this evening against a young, talented Edmonton squad. The Oilers have slid deep into the bottom of the Western Conference themselves, but they posses the lethal ability to strike at any moment. Something this Sabres team seems to lack. 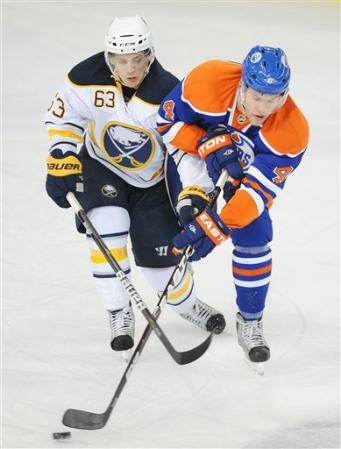 The Edmonton roster makes Buffalo’s look geriatric by comparison. Their scoring lines also pack a bit more punch than do the Sabres’ (particularly past the top line). For Buffalo, establishing a three-period effort will be vital. Asking any team, particularly the Sabres, to play 60 minutes is somewhat unrealistic. But putting forth a quality three-period game, with only a few minor lulls, would certainly register two points for the Sabres. It is time to stop pulling punches in net. Neither Buffalo goaltender has done much of anything lately. 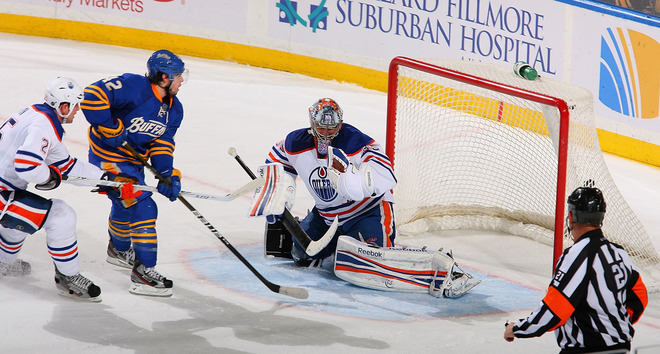 Ryan Miller, despite showing some signs of strong play, can’t keep less than three goals from getting behind him. Jhonas Enroth played a fine game on Saturday and gave his team a chance to win. Sadly, he folded in the shootout. Nevertheless. Enroth clearly is the better of the two goalies at this time. Ruff should ride him for a handful of games to see what he gets from the rookie. The points are too valuable to waste juggling struggling goaltenders.